Q-Dir makes your files and folder easy to manage. Fast and easy access, with an amazing Quadro-View technique. You don't have to renounce the usual, Drag and Drop, all Views, and other functions of your system. No! Q-Dir gives you other nice functions, that make you happy. One can save many hand moves and also time. It has icons to quickly change between various layouts of 1 / 2 / 3 / 4 directories. There are some downsides as other people have stated, but depending on the task, I'll make a choice of various file managers. If I need to work with multiple directories at the same time, then I always use Q-Dir, otherwise I'll use the default windows file manager or xplorer2 lite. The best there is. I cannot do without four panes. Development is continuous but the developer is not very responsive. Really great file manager, but it appears that most people today don't do much managing of files - the result of huge drives that fail so infrequently. Still, neatness is next to... and to that end, this is the best free file manager extant. It is so configurable, and the author updates and improves it frequently. This is a really good bit of software. 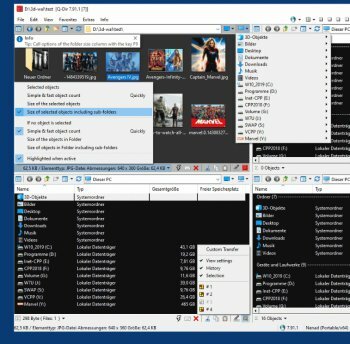 I have been a "two-pane" file manager for many years (How does anyone use a single pane file manager like Windows Explorer?). For several years I have been using the paid version of Xplorer2 (http://zabkat.com/index.htm) and will continue to use it. However, Q-Dir is on my "tool box" USB stick to install on friends PCs when I am asked for help. If you don't want to pay for Xplorer2 then Q-Dir or Nexus file manager (http://www.xiles.net/nexusfile/) are certainly worth a try. Great program. 6 annoying problems I can think of right now. 1. The tool bar icons are ridiculously small. I'm not kidding you, those icons are only about 2mm on some displays. I think Nenad has exceptional vision, and believes everyone else does. Come on man, make the icons 4x bigger, or at least an option for large icons. 2. The "Save Current State at Desktop" is wonderful, but has a Win 7 quirk. You can click the icon on the desktop and it works fine. However, when you pin it to the Task Bar, it starts in a tiny miniature window, not saving the window position and size settings. 3.When you choose to not show the address bar, the tool bar icons also disappear. A "back", "forward", and "up 1 level" button among others are very important even without an address bar. 4. Selecting the check boxes in the file window lags. You check the box, and it appears not to be checked. In a few seconds the box will then appear checked. This has been improved over the months, the delay used to be terrible, now it's not terrible, just bad. 5. Refreshing is slow or absent. When files are deleted or moved, the window is not updated. I must use F5 a lot, very annoying. 6. Large file operations completely lock the program. When unzipping, moving or deleting large files, the program is completely unresponsive until the operation finishes. The Windows Explorer does not do this. This is annoying. I think Q-Dir needs better multi threading functionality. Bottom Line: Looks to be a decent program of it's sort. I have no complaints other than it does not track with my way of interacting with my pc. That is not a bad thing. Just personal preference. For what it does, it does well. Pros: It has tabs and four windows. Many nice features. Highly configurable. Cons: Sadly, Q-Dir damaged my OS (Win8.1). I was using it to copy files and everything stalled out. After waiting for an eternity I Task Manager'd and killed the q-dir process. The result was a damaged registry and user profile. Bottom Line: Q-Dir damaged my registry. Pros: Excellent freeware alternative to XYPLORER which moved away from freeware. Does the job and is light weight. Love it! Cons: There are frequent updates but nothing new at all since couple of years. It's up to 4.32 now, and much better behaved. I don't use all the windows configurations, don't see any benefit to it. 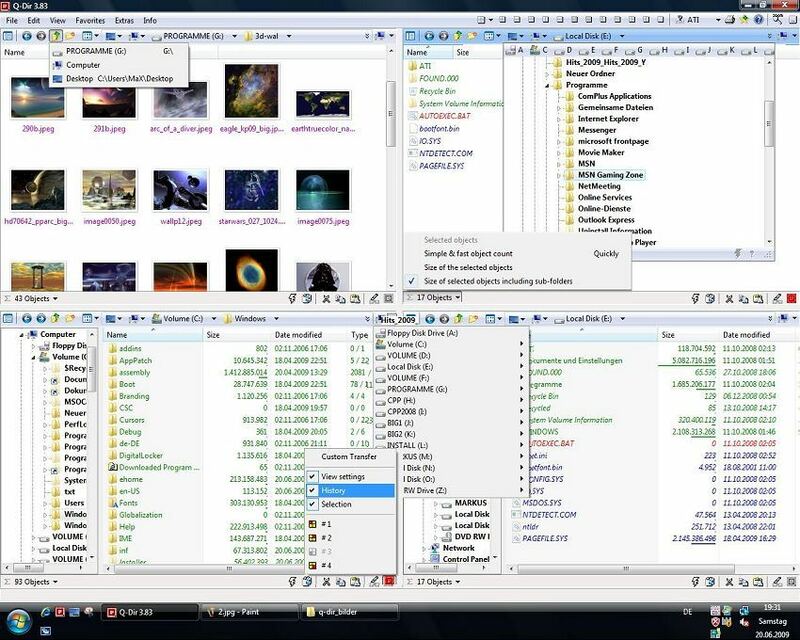 I use the tree on the left and files on the right, just like Windows Explorer. The Win7 explorer is a train wreck. It's buggy and jumpy, and there is no way to change the bright white colors. That's the main reason I use Q-Dir, changing color to a soothing light blue. I wish the file header size and position could be saved. I can never see the file size without right-clicking and selecting "size all columns to fit". But I think this is inherited from the Win Explorer. What a mess. The biggest problem just now is the failure to refresh. When you move folders on the left, they do not show until you press F5 (forced refresh). That's pretty aggravating, and makes me want to go back to Win Explorer or something else. 1 star off for that. I like free commander's file handling a bit better but switched back to this after the v 4.21 update. I have 3 drives installed and one external I leave off til I use it. I like the ability in using a 4 pain manager. With the last version it still has trouble handling copy and move. I have resorted to closing and reopening it on occasion because of this. In any case it does work well with teracopy which is all I need. I have disabled every option practically in this latest version. Will see how it behaves. I was using TC before this but you would have to have 2 copies open at all times which just wouldn't work for me. A little crash crept into this release. It's a pretty graceful crash; it just errors and closes. No Task Manager or re-boot needed to re-launch it. Since it's not a beta, it gets a point off for that. Other than that, the icons at top and in the status bar are so tiny and low res, they are not handy to use. Point off for that too. I should give a point off for the silly magnifier that attempts to "fix" the above, but I won't. Still problems with files appearing very slowly after copy or download. Other than that, it's a great program with great potential. What a mess, have you, guys, ever heard of Total Commander, let alone Far Manager? They are thousands times more convenient. Needs a search function, needs a tool bar to drop favorite folders on, needs better options for function and icons. The icons on the top and status bar are way too small on my laptop. *You can not select multiple files. You must select and delete files 1 at a time, a real slow process. *Downloaded files are very slow to appear, whereas they appear instantly in Win7 Explorer. It's a nice program, I hope the bugs get fixed.